All the layers of this cake are heavily layered with the layering of the vanilla cream. The top of the cake is adorned with the adventures texture made with jam and the cherries on the periphery of the cake. 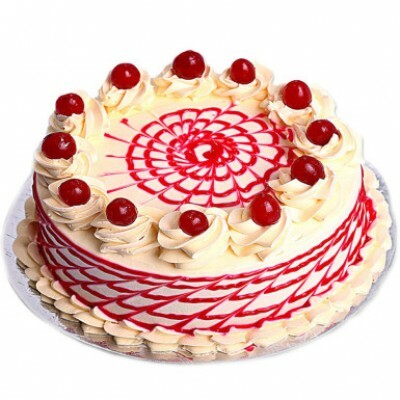 The cherries at the fencing of the cake are appealing and are accompanied with the swirls of the vanilla cream. The basic ingredients of the cake are flour, butter, sugar, vanilla essence, vanilla cream, whipped cream, eggs, jam for texture and cherries for decoration.